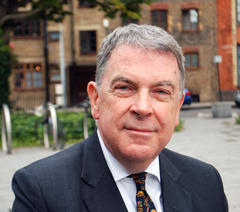 Terence Fane-Saunders, Chairman & Chief Executive of Chelgate. Before founding Chelgate in 1988 he was chairman and chief executive of Burson-Marsteller, one of the three largest public relations firms in the UK, and served as a member of that company’s international management board. He had earlier served on the worldwide board of Hill and Knowlton Inc, at that time the world’s largest public relations company. Based in New York, he managed 22 Hill and Knowlton offices in Asia, Latin America, Canada, Australia and New Zealand, while also directing all international business at the world headquarters. He had previously spent several years as managing director of Hill and Knowlton Asia Limited, during which time he also opened the first foreign public relations business in the People’s Republic of China. An honours graduate of Cambridge University, where he studied law and English, Terence Fane-Saunders has written, spoken and broadcast all over the world on different aspects of the public relations profession. As a specialist in transnational communications and public relations, he has managed a wealth of global and international programmes for governments, multinational companies and special interest organisations.